How do you know the right moving boxes to pick? Picking the right moving boxes can mean the difference between an easy move with everything arriving properly and a nightmare of difficult to carry boxes and broken items with any number of mishaps along the way. But how do you know which boxes to pick? That's where Box Brothers LA comes in. This page will help you pick the right boxes to fit your moving needs. We 're the the experts, with the experience and resources to make moving easier. This is an overview of some of the most often used moving boxes and their applications. It's meant to help without getting too complicated. If you need something special, or have a question, get a Quick Quote, give us a call online or email us. We're ready to to help and make it easy for you. The standard “Small Box,” a/k/a “Book Box” or “Record Box,” is a great moving box for smaller, heavier items. As the name suggests, it is considered as the standard box for packing books, LP records, and documents (if a File Box is unavailable to you). This box is especially used to pack heavier items, because of its size. A larger box filled with books, for example, will likely be too heavy to lift and manage. The Medium Box is an almost square box, perfect for general purpose use and moving nearly anything you can think of. It is an excellent choice for kitchen appliances, electronics, toys, and various not-too-heavy items. This box has the same width and length as the Medium Box (both are 18”L x 18” W), but is 8 inches taller. Because of its height, clothes fit perfectly when folded and stacked in a Large Box. Additionally, long items (like a toy truck) can fit in the Large Box standing up. There are 2 kinds of Extra Large Boxes, one is a square, while the other is rectangular. Very close to the same in volume, they are shaped differently. The square box is thicker and the rectangular one is taller/longer. These large box should not be filled with heavy items. They are ideal for moving bedding, comforters, pillows, jackets, and any other large, light items. There are a number of wardrobe boxes for you to choose from, and while they differ in shape in size, they all serve the same purpose: packing clothes that you do not wish to fold. Some clothes (dresses, suits, etc…) need to remain straight/upright. There are 2 standard upright wardrobe boxes, regular and large. They are the standard wardrobe moving boxes for adult clothes. Each comes with a metal bar to hang clothes from. These boxes are double-walled for extra heavy-duty protection. There are 2 “Shorty” wardrobe boxes, mainly for children’s clothing. They come in regular and large sizes, and each has a metal bar for hanging clothing. Additionally, there is a Flat-Laydown Wardrobe Box, which, as the name implies, is flat and the clothes are laid down inside the box. This box does not have a bar. This box is similar to the standard Large Box in shape, however it is 4 inches taller and double-walled for extra protection for your dishes. Also, this box is designed to be used with a Cell-Kit, which is a set of cardboard sheets which are inserted into the box systematically to form compartments for various dishes. Experts recommend adding a bit of bubble paper or blank newsprint around each dish for additional protection. This box may also be used without the Cell-Kit as a regular, heavy duty box, slightly larger than the standard Large Box, but not quite as bulky as the Extra Large Boxes. 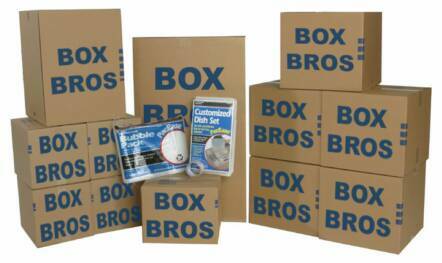 Boxbrosla.com has a complete line of packing, moving and shipping supplies, specialty boxes and offer packing and crating services for valuable items requiring extra protection. Get a Quick Quote, give us a call online or email us We're here to help!